IVORYTON – The Ivoryton Village Farmers Market turns 5! Each Saturday starting at 10 a.m., the Ivoryton Green will be bustling with vendors showcasing CT-grown products and prepared foods, creations from local artisans and crafters, and live music every week. Each week seasonal produce, meats, fish, cheeses, milk, ice cream, garlic, maple syrup, honey, coffee, flowers, shrubs, jams and jellies, bakery items and more will be available. Between 10 a.m. and 1:30 p.m., families are invited to visit Ivoryton, shop the market and enjoy live bands playing each week in the Gazebo. With the array of foods on offer every week, he goes on to say, “We really just want people to think about supporting local farmers, shopping local, buying local. 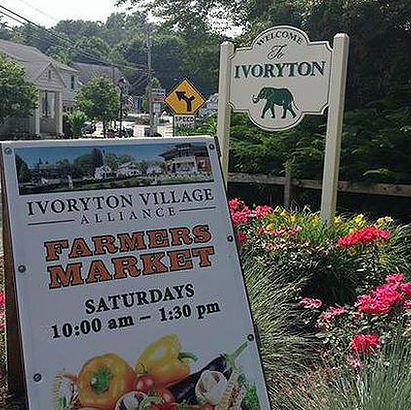 Buying local builds strong communities and building a strong community is what the Ivoryton Village Alliance is all about.” More information at www.ivorytonfarmersmarket.com. CT Farmers’ Market Nutrition Program – WIC/Senior (FMNP) Checks Accepted.